Theodore Sorensen’s “Kennedy” was published in 1965, little more than a year after JFK’s assassination. Sorensen served as chief legislative aide to Senator Kennedy and as Special Counsel, adviser and speechwriter to President Kennedy. He also reportedly wrote or edited much of JFK’s Pulitzer Prize-winning “Profiles in Courage.” Sorensen died in 2010 at the age of 82. Sorensen’s 758-page biography of Kennedy is nontraditional in many ways: by virtue of its extraordinary proximity to both its subject and the times, for its strictly thematic coverage and for its commitment to revealing the inner workings of a presidency at the expense of broader context and character development. The unique access Sorensen provides readers is undoubtedly the book’s best attribute…as well as its most significant shortcoming. During most of its twenty-five chapters, the reader is treated to a fascinating “fly on the wall” account of the Kennedy presidency: from mundane daily tasks to the chaotic excitement of crisis. Sorensen examines issues in a consistently clear, sober and extremely organized way…but one which sometimes proves dry and dull. The author’s affection for his former boss is quickly obvious; Sorensen admits to an affinity for Kennedy during the book’s first pages. Because of this close bond between author and subject it is not surprising that many of Kennedy’s weaknesses are glossed over or explained away…and that his most jarring flaws are ignored altogether. And while Sorensen waives the biographer’s ultimate right to judge his subject’s legacy – astutely admitting he is too close Kennedy to provide a balanced assessment – there is never any doubt what his verdict would be. Because Sorensen tends to report only what he observed, the first thirty-six years of Kennedy’s life are covered with great haste. But more unfortunate for readers new to JFK is that relatively little is revealed of the most compelling and important personalities who fell outside the tight Kennedy/Sorensen circle (Jackie Kennedy, LBJ and Khrushchev, for example). These figures wander in and out of the narrative but never come to life with full vigor. 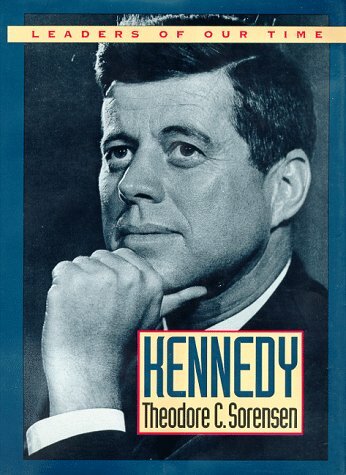 While each of the topics Sorensen covers during Kennedy’s presidency are examined thoughtfully and carefully (civil rights and economics issues domestically, the Bay of Pigs, the Berlin Crisis and numerous other issues internationally) there is a lack of chronological or historical context to aid the reader. And the author’s discussion of Kennedy’s Cabinet selection, in particular, lacks the penetrating insight I would expect from an insider with Sorensen’s perspective. But the author’s revelations about many aspects of the Kennedy presidency prove fascinating. The chapters covering Kennedy’s campaign for the Democratic nomination in 1960, the voting forensics behind Kennedy’s presidential election, and Kennedy’s commitment to the U.S. space program are notably excellent. And readers interested in observing the daily behind the scenes routine of a presidential administration will be frequently delighted. Overall, Ted Sorensen’s “Kennedy” offers a compelling journey for readers interested in (and already somewhat familiar with) John F. Kennedy. Evaluated as a unique, if sympathetic, window into the last eleven years of JFK’s life and inner circle, this book is often outstanding. But judged as a comprehensive biography offering a balanced assessment of its subject’s successes and failures, it falls undeniably short. I look forward to your future reviews of JFK books. Like many of the presidents whose lives I’ve absorbed, JFK strikes me as a complex, multi-dimensional and at times paradoxical character. I’m really enjoying reading about him and I imagine your course is going to be fascinating! I visit your blog fairly often to get book recommendations. I have noticed that you plan on reading more biographies on Kennedy than most presidents previously, is that because there is more written on JFK or is he your favorite? In part due to how much has been written about him, in part due to his “mystique” and in part due to the fact that since he is one of the later presidents I’ve had more people tell me that I just “have” to read one particular bio or another about him…the pages have certainly added up! Thanks for the reply. That makes a lot of sense.